Trumpf has expanded its technology and product range in additive manufacturing by introducing its new TruPrint 1000 laser metal-fusion (LMF) machine to the U.S. market. 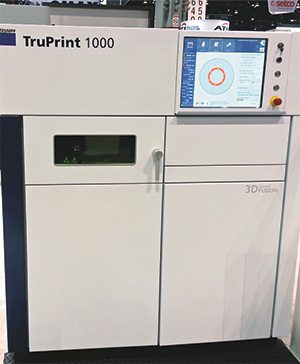 The TruPrint 1000 uses a laser and metallic powder to build components based on data supplied directly by a CAD program. LMF systems create the component, layer by layer, from metal powders with grain sizes as small as 20 microns. This technology proves ideal for parts that are complex in their geometry, such as those with internal channels and hollow spaces, and for economically manufacturing individual parts or short production runs. As seen at IMTS 2016, the compact machine appeals to novices as well as those experienced in additive-manufacturing technology. It can generate parts that are a maximum of 100 mm dia. and 100 mm tall. The user interface with touchscreen control steps the operator intuitively through the individual phases of the process. All of the components, including the laser, optics, process enclosure, filter unit and control cabinet, are integrated into the compact housing of the TruPrint 1000. During the build, a layer of metal powder is applied to a substrate plate and then a 200-W laser fuses the cross-section of the geometry to the plate. After the exposure, the plate is lowered and the next layer of powder is applied. The procedure is repeated until the part is finished. The entire process takes place inside the enclosure, blanketed by protective gas, and at an oxygen content of 0.1 percent for maximum part quality.